A British Academy funded conference devoted to the sources, reception, and thought of the Cambridge Platonist Ralph Cudworth. Centre for the Study of Platonism Fellow Dr. Adrian Mihai hosted the conference ‘Ralph Cudworth at the Crossroads of Modernity’, 11 March 2019, with funds won as part of his post-doctoral fellowship from The British Academy. The Conference, which coincides with Dr. Mihai’s critical edition of Ralph Cudworth’s The True Intellectual System of the Universe, forthcoming with Brepols, traced both the sources and influence of Ralph Cudworth’s thought. Click here for the event’s programme. For Call for Papers see here. Early modern philosophy is often viewed as characterized by a crucial transition from the vitalist natural philosophy of the Renaissance to the new mechanistic natural philosophy of the seventeenth century. However, vitalism in fact continued to thrive in the early modern period, particularly in the writings of a group of philosophers associated with Cambridge Platonism. Thinkers such as Margaret Cavendish, Anne Conway, Ralph Cudworth, and Henry More each developed their own distinctive form of vitalism, and collectively provided a powerful counterpoint to Cartesian mechanism. But while all these philosophers were united in their deep commitment to the irreducibility and universality of life, the details of their respective views vary considerably. 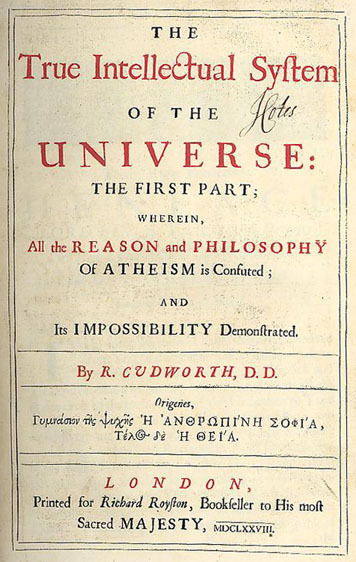 Whereas Cavendish and Conway, for instance, proposed monist frameworks to ground their vitalism, Cudworth and More remained wedded to a dualist metaphysics. Moreover, while early modern vitalism is perhaps most prominent in the writings of the Cambridge Platonists, it also left its mark on numerous other philosophers of the period such as Leibniz and Spinoza. This conference proposes to examine vitalism as a philosophical movement in the early modern period, as well as the various metaphysical, moral, and theological considerations underlying it.